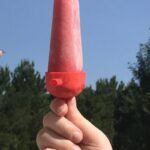 These Watermelon Raspberry Ice Pops are my girls’ favorite! The lemon juice really lets the fruit flavors pop, so don’t leave it out. Place the watermelon, raspberries, and lemon juice into a blender/food processor and blend on high speed until the mixture is smooth. Taste and add sugar if desired/as needed. Blend until sugar is incorporated. Pour the mixture into ice pop molds and insert sticks or handles. Freeze until firm, at least 4 hours. When ready to eat, run the molds under hot water to release the ice pop.